A geometric tessellation covers a plane with a pattern of shapes in such a way that no region is left uncovered. 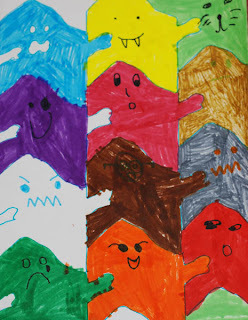 I'm not sure how I happened across this blog, Julie K in Taiwan, but hats off for this great idea: Art Lesson: M.C. Escher. Check it out. It's great fun and doesn't take long. 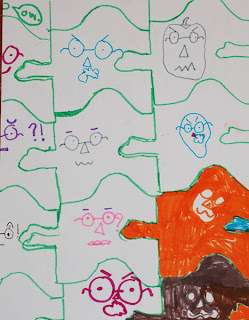 Art and math and ghosts, oh my! Who can resist? The fine young gents, that's who. 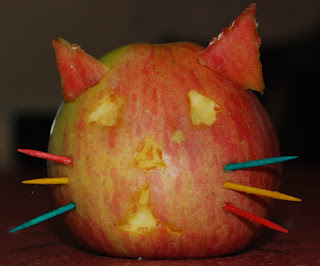 To my cheerful suggestion that we do a fun Halloween project: "Do we haaave to?" Actually, I kind of have this desire to instill a love of learning and all of that happy sunshine. So I didn't really threaten them with math. I just replied, "Yes." Once we got started, the not-so-fine young gents became fine and dandy. Then kindergarten gent began to fuss and moan. Finally he said in frustration, "But I can't do it perfect!" Okay. He's right. It's not perfect. And I'm not about to tell him that it is perfect because he'd know it was a lie. So I told him it was total crap and he had to start over. There it is, that love of learning thing again. Not really. I really told my fine young perfectionist The Rules, honed by his fine perfectionist older brother. They don't take after me, by the way. "Did you try?" Yes, he nodded. "Do your best?" Nod. "All right, then give yourself a break. You've done exactly what you're supposed to. Need help?" Another nod. Turns out the littlest gent was not as interested in tesselations as he was flying chess pieces around the room and rolling on the floor with the cat. I'd been making a tesselation page for him to color. 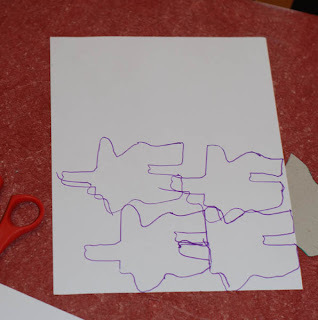 Instead, I told frustrated kindergarten gent to keep trying, and when I was done tracing my page we'd trade. I'd wondered from the beginning if the project might be a little much for his emerging fine motor skills, anyway, and so it was. But then again, if we only give our children the things we are certain they can accomplish, they rarely face new challenges, don't get the opportunity to work through frustration, and they don't get to surprise us with abilities we'd never suspected. It all worked out. Kindergarten gent was delighted by the black-and-white faces in Julie K's example, so he spent a good amount of time copying them with his own little twists. 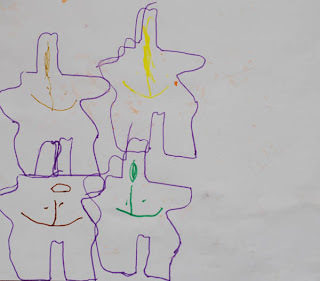 The youngest gent decided he wanted to get in on the fun too and happily drew little ghost faces on his brother's rejected artwork. "Who are you voting for?" Seven-year-old gent asked this of a little boy on the playground. The little boy was threeish. The dad replied that the little boy would vote for Barack Obama, if he knew who he was. "Oh, yeah. I know who that is," replied my fine young gent. "I might vote for him too." Very earnest. He takes his politics seriously. Later we drove by a yard full of political signs. "Mom, I'm voting for Jim Torrey for mayor." I asked if it was because of all of the signs. "Well, maybe." I pointed out that a person with a lot of signs might just be the person with the most money, or the person that everyone else was voting for. Are those good reasons to choose someone to be mayor? "Well, Mom, I really want to vote for him because he was a good mayor last time, and he's a stronger leader. I want to have a strong leader." Sounds like someone has been listening at the dinner table after all. I thought he was just drawing designs in the sauce on his plate and trying to golf the peas in his soup. Not only that, but he drew his own conclusions from a discussion about the merits of each candidate. Heck, I'd far rather, any day, that he make his own decisions based on information he's gathered than let me tell him how to vote anyway. He was a little disappointed to learn that he has to wait another 11 years to exercise his civic duty. I did let him drop my ballot into the drop box today, though, which was almost as good even if I didn't vote for his choice of mayoral candidate. Hmmm. Maybe I should start dinner table debates over the relative merits of keeping one's floor picked up versus always remembering to make one's bed without being reminded. 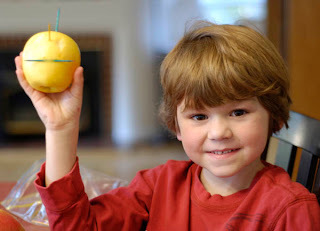 Kindergarten gent carved a star into his apple. Second-grade gent made a snowman. 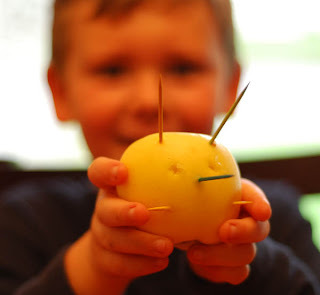 This guy happily poked lots of toothpicks into his apple and called it a thing. A "sing." Darn, he's cute. What kind of thing? "I don't know. Just a sing." It's not so much what he says as the way he says it. He's just a little hoot. The fun didn't stop there. We've still got a huge bowl of apples in the kitchen and even more in the garage. This fine young gent made a guy smiling. What's that on his head? Hair. One hair because he ran out of toothpicks. Another guy smiling? Nope, this is an alien. Now kindergarten gent's smiling guy is really an alien too because he likes that idea better. We ended up with a snowman, two aliens (or an alien and a smiling guy with one hair), a cat, a bitten star, a carved star, a toothpick star, and two "sings". And, eventually, a giant bowl of apples slices on the table for a snack. Not bad for a morning's work. It was beautiful yesterday. 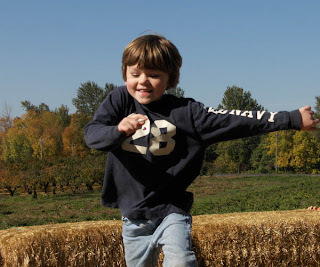 So beautiful that we rushed through math and language arts, piled in the car and drove out to the apple orchard. Just the drive into the country on a sunny fall day would have been a good reason to ditch school today. Oregon is beautiful in the fall. The fine young gents were delighted to see their new favorite apple on the trees: Granny Smiths. I promised them a pie if they picked at least eight green apples. We've got an entire bucket almost full of Grannies. 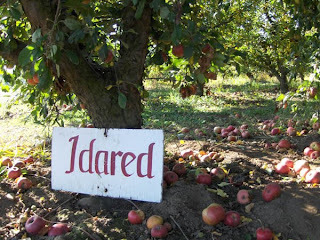 I found a new favorite apple, Idared. They're a round red squatty apple, white-fleshed, crisp and sweet. I thought, "Oh, we'll come home with a bag of apples." Heh. Each of the fine young gents wanted his own bucket. Each fine young gent felt that he should fill his own bucket. We've got bags of apples in the garage. 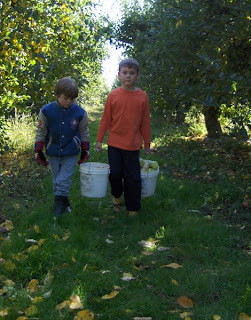 One of my favorite moments of the day: Eldest gent offering to help his brother carry the heavy apple bucket. 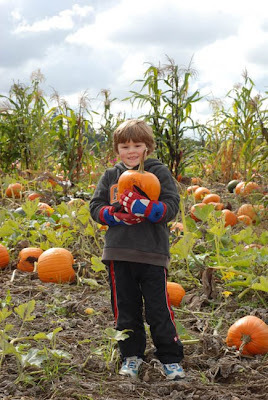 The farm has a little hay maze, a farm stand, and lots of fall and Halloween decorations. Cute without turning into the crowded circus of the Hayrides and Cornmaze! farm. We admired the decorations and chose two more pumpkins for the front porch. We shopped at the farm stand. The fine young gents and I chose a few butternut squash, some delicata squash, and a jug of apple cider. Then the fine young gents played in the hay maze while I soaked in the sun. Time for nature journals. This is a school day, after all. When we got home the phone rang. It was lovely elderly neighbor, inviting us to come pick up her windfall apples before her yard guy comes and throws them in the yard waste barrel. Last night I dried apples, and I've got more to dry tonight. This morning we picked up the neighbor's yard and made a huge apple crisp. I was talking to a woman I know, and she mentioned that she wasn't close to her brother, and that her husband was not close to his brother. And I wondered, How does that happen? And, more importantly, how do I keep that from happening? I know. Part of the answer is that I don't. I can't. They will grow up to be their own people, with their own directions, their own differences, their own choices and ideas and paths. I cannot force them to love one another. Heaven knows, my sisters and I....who would have guessed that we'd have such genuine regard and enjoyment for one another as adults? My lovely Irie sis was so much younger. She grew up in a different place, at a different time, nearly in a different family. My Busy Farm sis and I bickered constantly. We didn't seem to have much in common. Now, I consider them to be my best friends. And yet, along with my mother, these are the women I love and treasure the most in the world, my sisters. I admire my sisters. I rely on my sisters. I value their thoughts. They make me laugh, and I know if I needed a shoulder upon which to cry they'd be right there. They are a part of my daily life even when I haven't talked to them for weeks because I know that if I need them all I have to do is pick up the phone to say, "What do you think about this?" Or "When are you butchering chickens?" Maybe it has something to do with a shared childhood, shared values and experiences that transcend religious, political, philosophical differences. 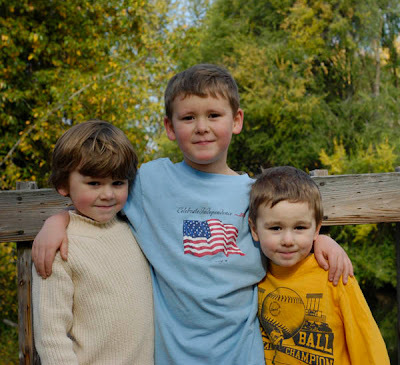 I don't know how to create that for my boys, other than to remind them every day: You are brothers. When everyone else in your life has moved on, you will still be brothers. Fight if you must, but forgive one another. Love each other. Take care of each other. Help one another. Be kind and honest and gracious to one another. And call your mom once in a while when you're grown. This is what our street looked like this morning. 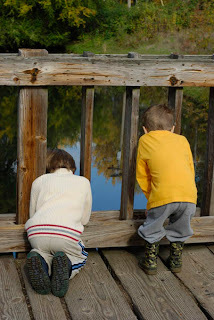 For our school "warm-up," our let's-get-started activity, I took the fine young gents for a walk this sunny morning, down the street, looking for treasures. It's been raining off and on. This morning was too glorious to stay in. Besides, I reasoned, we're about to run out of glorious fall mornings. We've got months of chill rainy days to look forward to, and spending a morning out of doors now will fill us with sunshine for the days ahead. 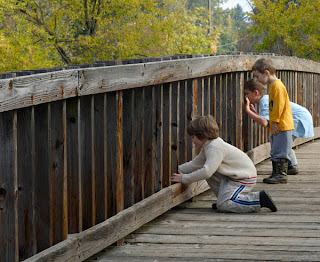 When we arrived home, we set up an impromptu nature study. 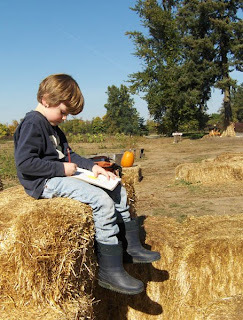 Given the direction, "Time to make a nature journal entry!" the fine young gents are likely to stare blankly out the window, draw a Pokemon, scribble aimlessly before announcing "All done!" or revolt altogether. 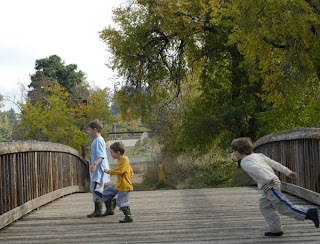 This morning I gave two directions: Explore what interests you for as long as you'd like. Then in your nature journal you may.....and I offered several choices. 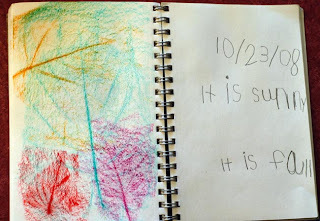 One fine young gent chose to color a cider press page and paste it in his journal, the other did leaf rubbings. (The youngest gent set up the chess board and played games with the chess people. 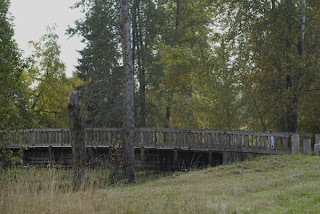 They had fine adventures.) While the guys colored or played, we listened to a recording of Native American stories from the library. They especially enjoyed the stories of Coyote, a story titled, "The Poop People," the storyteller's stories of his own family, and the way all of the stories ended with "And that is all." Our quick warm-up activity took over an hour. We didn't get much else done this morning, at least in the way of formal schooling. A little music, a little math, some language arts, lots of read-aloud time, a science activity. 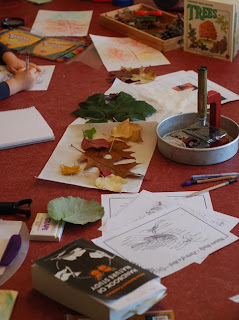 But embedded in this simple morning activity, beyond physical exercise and appreciation of nature's beauty: Handwriting, spelling new words, finding the date, history and culture from the stories on tape and from our discussion of the apple press, art, and science and nature in our continued discussions and examinations of leaves. Not only that, but the gents were invigorated by our walk, and completed most the rest of their schoolwork before lunch. It is sunny. 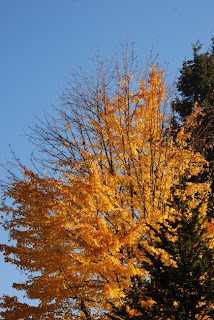 It is fall. No, no! bring me an apple from the tree of life! One of our favorite things about fall is fresh ripe apples. Apple pie, applesauce, dried apples, apple muffins. They're fun to pick, fun to cook with, fun to play with, and fun to eat. We've been gifted with friends who have apple trees, including our lovely neighbor, so we've got dried apples in the pantry and pie filling in the freezer. 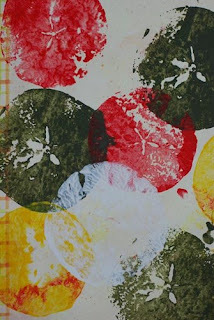 The fine young gents made apple prints on white paper with a few of the apples we were gifted by our lovely neighbor. They wrote, "We love apples!" and "We love Joyce!" and "Thank you for the apples!" 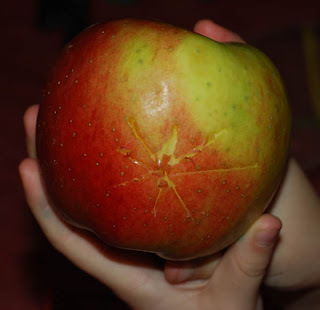 "#59: While eating an apple, locate the seeds and remants of the flower's calyx and stamens, as shown halfway down our Fruity Orientation Page." What a hoot! The fine young gents and I spent a hilarious twenty minutes bobbing for apples on Friday. We didn't have one of those galvanized buckets, so we made do with a plastic storage bin from the closet. The younger gents were hesitant in an "Are you crazy?" kind of way, until their elder brother shoved his face clear to the bottom of the bin to get his teeth into the biggest reddest apple of the bunch. Then they all got into the spirit of the game, until even Mom ducked under. We were soaked and breathless from laughing. 5. 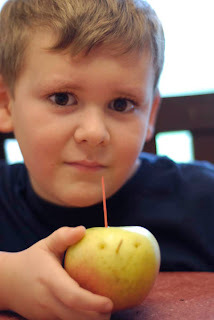 Compare apples to apples: Hold an apple-tasting. This year ('08) the Jonagold was still the favorite for most of us, but there was a surprise runner-up. 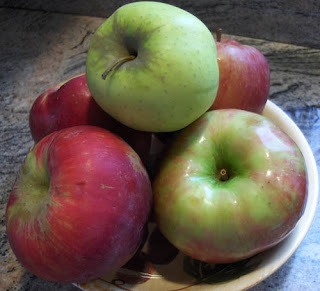 The divinely crisp, but decidedly less flavorful Honeycrisp, was unseated by the Granny Smith apple, and the deciding votes came from our pickiest children--just the two you'd think would prefer the blander sweet taste of the Honeycrisp over the tart Grannies. 6. 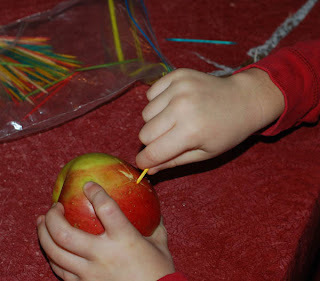 Visit www.allaboutapples.com It's all about apples. No kidding. 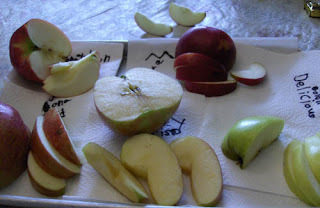 Interested in apple varieties? 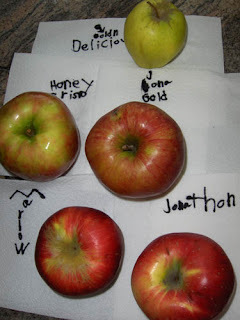 More than you'd ever want to know about apple varieties on the Comprehensive Apple Variety List. 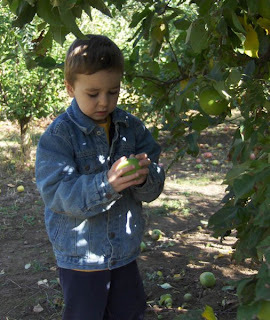 Find an orchard near you on their Orchards page. 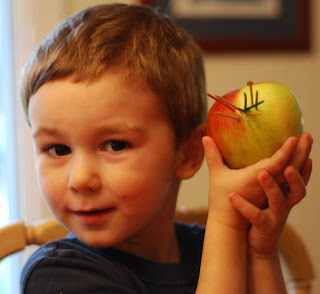 Read about apples and health. 7. Head to the orchard. An apple tastes its very best when you've just plucked it from the tree. 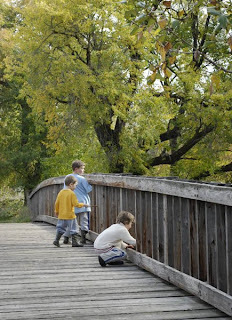 An outing to the orchard on a cool fall day makes a lovely nature outing. 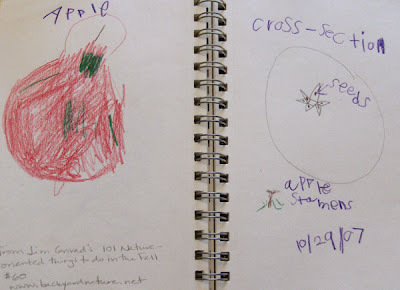 Take your notebooks out to explore the orchard, and pick a few apples to bring home. 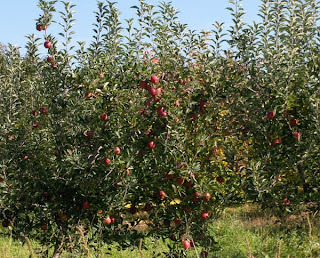 One Good Apple: Growing Our Food for the Sake of the Earth, Catherine Paladino. Apples to Oregon: Being the (Slightly) True Narrative of How a Brave Pioneer Father Brought Apples, Peaches, Pears, Plums, Grapes, and Cherries (and Children) Across the Plains (Deborah Hopkinson, illustrated by Nancy Henderson). 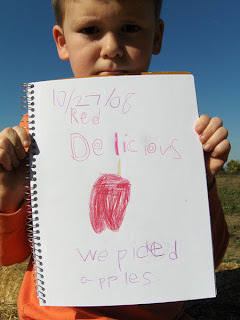 A delightful tall tale, the story of how a young girl named Delicious (along with her brothers and sisters) helps her daddy bring an orchard from Iowa to Oregon. 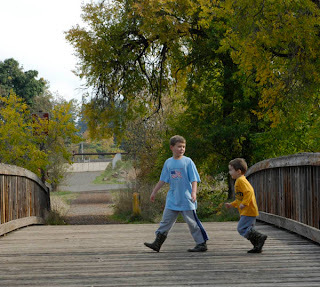 Outlandish as only a tall tale can be, it is based on the true story of Henderson Lewelling and his family, who brought apple and other fruit trees to the Willamette Valley and planted the first orchard in Milwaukee, Oregon. The story is a perfect read-aloud, funny and clever, and the illustrations are wonderful. How Do Apples Grow? (Let's Read and Find Out Science) , Betsy Maestro, Ill. by Giulio Maestro. We enjoy all of the Let's Read and Find Out Science series. They're always informative and always have great illustrations. We've got this one on hold from the library. The Apple Pie Tree , Zoe Hall, Ill. by Shari Halpern. 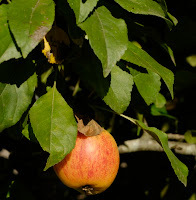 A book following the development of an apple tree through the seasons. The illustrations remind me a little of Lois Ehlert, who wrote a similar book called Pie in the Sky about a cherry tree. The Seasons of Arnold's Apple Tree , Gail Gibbons. One of the many things we appreciate about studying apples is that they offer the opportunity to study the seasons, so the study extends beyond just what we can do in the fall. We've already planned a spring visit to the apple orchard, and to our neighbor's back yard trees, to see the blossoms as they grow and develop into apples. The Seasons of Arnold's Apple Tree follows the seasonal changes of an apple tree, making it a perfect book to read now, and re-read in the spring as the fruit trees begin to bloom. We really enjoy Gail Gibbons books. We've requested this book from the library as well. During apple season all of the apple books are out. Pumpkin books too. Thank goodness for the online request system. We've placed a hold on several apple books and pumpkin books. We have not yet tried these projects, but they're definitely on the to-do list. If we don't get to them this year, definitely next year. Dried apple wreaths or garlands and apple dolls. 10. An apple a day keeps the doctor away. Eat up! They're delicious, inexpensive and nutritious. Apples, Apples! A mini unit study page. 6:22 a.m. &*%^(&$#. Alarm goes off. Hit the snooze. 6:30 &*%^(&$#. Alarm goes off. Hit the snooze. 6:38 &*%^(&$#. Alarm goes off. Hit the snooze. 6:40 Drag my weary self out of bed. Leave the alarm so that loving husband has to roll over to my side of the bed to turn it off, which will hopefully get him to drag his sorry a....ah, weary self out of bed. 7ish Let the dog out. Let down the chicken coop ramp. "Oh, giant weird chicken mom! Where's our food?" they ask in chicken language. Feed the chickens. Bring the dog back in with me. Make breakfast. This morning it's toasted bagels, scrambled eggs and sliced apples. 7:20 or so Listen for lovely lady stirring overhead. She's supposed to be downstairs by now, but alas, she's still in bed. Her lovely sister is at her dad's on Monday mornings, so no need to wake her. I wake the fine young gents by opening the curtains to let in the morning. 8:00 Breakfast is over. The lovely ladies have a deadline, a bus to catch or a friend to meet to get to school on time. But the fine young gents can daaaaaaawwwwwdle their way through breakfast, so plates clear at 8 whether they've finished or not. I help the fine young gents dress, brush, make beds, do their chores. I can hear loving husband and lovely lady chatting as they clean the kitchen together. Lovely lady's friend arrives and she's off to high school for the day. 8:30 I take a shower and dress while loving husband helps the fine young gents with their Monday morning chore, tidying the play room. 9:00 School starts. The fine young gents haul their school boxes to the table. We start with our morning warm-up. The gents were having a hard time coming to the table. Grumpy attitudes and dawdling, and a frustrated momma, were the order of the morning. I realized that I was asking them to start their day with a concentration-intensive activity. Math may be a favorite, but it takes a lot of mental energy. I took a two-pronged approach. I addressed the attitudes: "No more grumping, groaning, fighting, fussing, or farting when I ask you to start school," I said. "When I say, 'Let's get started,' I want to hear 'Yes, Mom' and see you get your box without being asked again," I said. And I addressed the teaching: Now we start with a light and enjoyable learning activity, something to ease young minds through the transition from play thinking to concentration. Monday morning warm-ups are mazes for kindergarten gent and a Math Minute sheet for second-grade gent. Preschool gent decides to play with a puzzle on the couch instead of joining us at the table today. Preschool gent comes to sit on my lap for a while, plays with the counting bears, then goes to play with his brother. 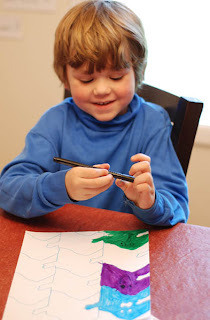 Kindergarten gent does a Miquon math sheet using the counting bears, practices making "L" and "l" on a handwriting sheet, and works on his alphabet book/memory poem, "A was an apple pie." He takes a break when he's done, playing chess and Legos with his younger brother. Second grade gent works through math, his Language Arts, and Challenging Word Problems. 10:15 (I think) We all take a break. The guys are playing Legos. I am surfing the Internet. 10:35 We all come back to the table. The fine young gents finish a few odds and ends, then work on their history project. We're trying History Pockets this fall. The curious young gents are interested in Native Americans, so I purchased the Native Americans unit. I'll try to remember to write a curriculum review once we've completed the unit, to go over what we liked and didn't. As the fine young gents colored, cut and pasted, I read out loud, Native American tales from Keepers of the Earth: Native American Stories and Environmental Activities for Children (Keepers of the Earth) (Joseph Bruchac & Michael Caduto), with Under the Green Corn Moon: Native American Lullabies playing in the background. Preschool gent gets tired of coloring, so he sits in my lap while I read. His kindergarten brother soon joins him. 11:30 Time to make Navajo fry bread. I give each boy his own bowl, so they each mix up and flatten their own little breads. This link has both a recipe and some history, which we read while the bread was frying. The background information was interesting and the fry bread was delicious. Noon Lunch for the fine young gents. We're reading The Black Stallion (Walter Farley), but the gents enjoyed the Native American tales so much that we continued reading from Keepers of the Earth. The first lunchtime story was a Pacific Northwest story of mountains and rivers that we know and love, the Columbia River and the Willamette, and the mountains now known as Mount St. Helens, Mount Adams and Mount Hood. 1:00 Back to school. The fine young gents take turns practicing piano and playing games in Japanese on the computer. 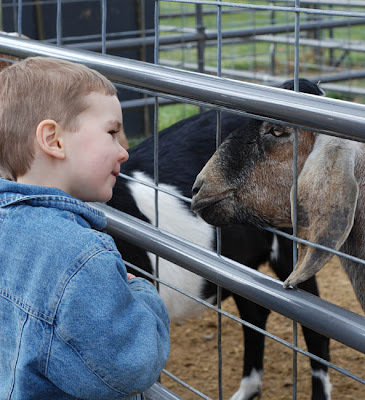 Preschool gent alternates between the two activities. He likes to "practice" too so that he can get a sticker. As soon as piano practice is over, they all go outside to play with the dog. 3:00 Quiet time. Second-grade gent is upstairs with his reading book, Detectives in Togas (Henry Winterfeld). Kindergarten gent is on the couch with his bin of Legos. Preschool gent is playing with toys on his bed. It's awfully quiet in there, so I think he may have gone to sleep. I'm working on this post. In a moment, I'll go out to collect eggs and feed something green to the chickens. Oh, and I ate lunch around this time too, leftover pasta. Sometimes I forget. 3:45 Lovely lady the younger usually arrives home around now, but she's not here. She's officially at her dad's on Mondays, but it's easier for her to ride the bus home and meet him here than it is for him to fight the traffic at the school. I called her dad. He'd picked her up and forgotten to tell me. Lovely lady the younger is usually closely followed by her older sister, who bikes home from school. She gets a snack then settles in to do her chores and homework. 4:00 Quiet time is over. It's nearly time to take the eldest of the gents to his choir practice, so he's getting his shoes. I realize I haven't brushed my hair since I took a shower this morning, and I'm wearing my ancient too-big jeans with the coffee stain and the hole in the knee. (Just keepin' it real. Most days are like this one. Honest.) I brush my hair and contemplate running upstairs to change, but I decide I can't be bothered. 4:15 Choir drop-off. I leave the younger gents with their oldest sister for a few minutes. I contemplate staying to watch the rehearsal, but I've forgotten swim things and a snack for choir gent, who's got swim lessons immediately following choir. 5:15 I pack fine young gent's swim bag and head out to pick him up from choir. When I get there, he's so wiggly that the director has to ask him to move to sit between two of the fifth graders. She assures me afterward that it's normal, and that he'd been quite well-behaved up until then. We drive straight from choir practice to the pool. Fine young gent eats a snack in the car and changes at the pool. There is a family changing room at the pool, but it's always full, so I let him change in the locker room by himself. With strict but low-key instructions to talk to no one, to change and come right out, to leave immediately if anything makes him uncomfortable. It's a challenge trying to give those kind of directions to my child. I want to allow him freedom and independence. I want to protect him and teach him to protect himself without making him afraid because I know who might be in there, but he doesn't yet. I'm not too worried. There are several dads in that locker room with their own children. They grin at me as I give him his instructions while they walk by us. As long as fine young gent follows my directions--don't talk to anyone, stay in the public area, leave if you feel uncomfortable, yell if you need help--a dad would help him even before I dash into the men's locker room. When he comes out, he tells me, "I made a friend. It's that kid over there. I told him where I live and what our house looks like. And the number." Sigh. While talkative young gent swims, I finally finish the last three pages of the Michael Pollan article I'd posted the link to a few days ago. I love the idea of a Victory Garden. 6:35 We arrive home. Loving husband is putting the finishing touches on dinner: Pasta with tomato sauce, green salad. Lovely lady the elder is out, babysitting. After dinner I get the fine young gents ready for bed while lovely lady, returned from her babysitting job, helps loving husband clean the kitchen. I gave her that particular chore on purpose. Time with Dad is at a premium in our busy family, and it gives them a time to stay connected and maintain their wonderful relationship. 8:00 I read The Black Stallion to the boys. I give them hugs, and kisses, and blow the scary away before I turn out the light. I'll hang out here for a while, then off to bed for me. Tomorrow, I'll do it all over again. Finally, a typical day. Not very exciting, but it's our life. Every day can't be field trips and fantastic art projects and rah rah rah. Life is good. 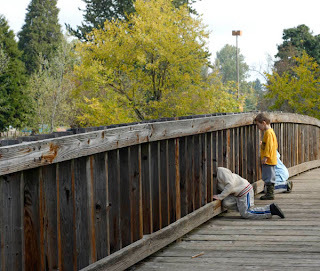 A blog offering a weekly challenge for Kids Who Think. Last week's challenge: Build a structure that will hold an egg at least one inch off the table, using nothing but drinking straws and tape. The fine young gents and I discovered the challenge too late to participate this week, but we may try it anyway as an add-on to our other egg-speriments. And you can bet we'll be playing in the future! I spent this weekend with my dear friends. Our friendship has lasted for almost thirty years. We've been through a lot together: Marriages and divorces and careers and children and so many of the other tragedies and triumphs and challenges that life has to offer. But we've also been through the silly things. We've watched one another trip and fall on our rear ends. Misheard or misspoke to the hilarity of those around us. Goosed and been goosed. Forgotten toothbrushes, hairbrushes, keys, socks, and just about anything else that can be forgotten. Eaten fudge and cheese for dinner. Gotten lost or rained on. Scared by spiders. Scared by fake spiders. Scared by the scary waitress who brought me my "damn coffee" and insisted I order right now. We've laughed together an awful lot. We love one another, farts and all. So, dear reader, if you've got a friend in front of whom you cannot fart and be forgiven, gently teased, loved; if you have friends who would be shocked or offended by a fart, find new friends. Dear friends, I love you and miss you.